We're visiting the coast of northeastern Normandy, northeast of the mouth of the Seine river at Le Havre. This is what the French call Haute-Normandie, or Hâote-Normaundie in Norman. We have been staying on the bank of the Seine at Le Mesnil-sous-Jumièges in a loop or boucle of the Seine below Rouen. From there we will go north to Yvetot and its modern Church of Saint Peter. Then further north to see the Château de Bosmelet near Auffay. Then we will continue west to Valmont and Abbaye de Valmont. From there we will continue to the coast, to Cape Fagnet overlooking Fécamp and its harbor. 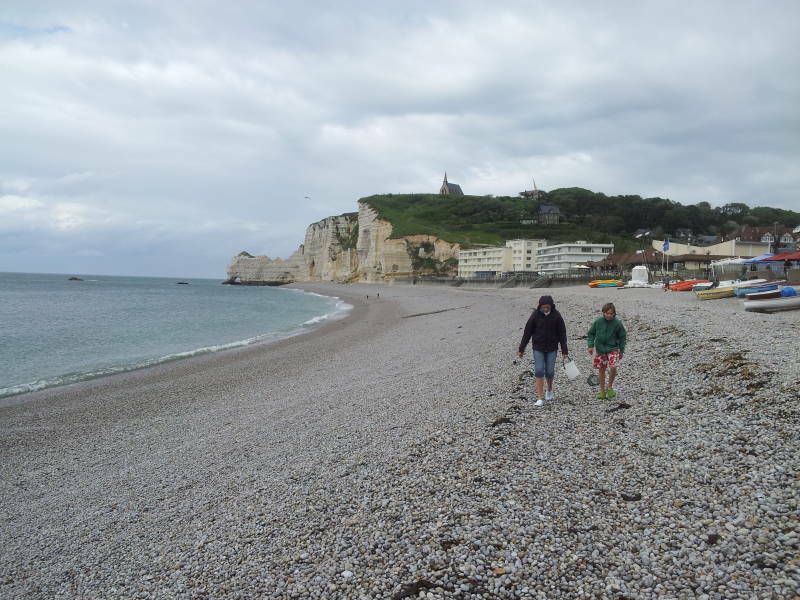 Then along the coast road through Yport to Étretat to see the coast and cliffs that inspired so many artists and authors. See the magenta arrowheads for the locations. Duclair is west of Rouen, at the north end of the next boucle or loop of the Seine downstream from Rouen. 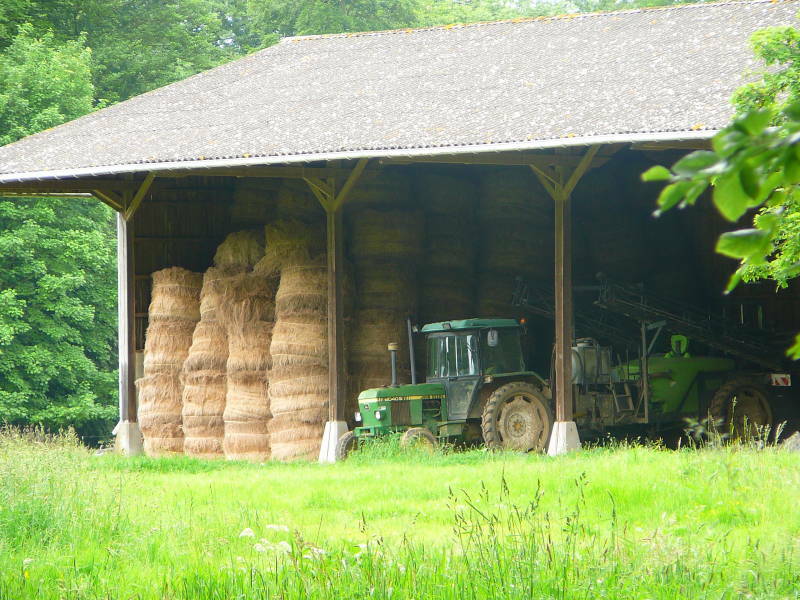 Le Mesnil-sous-Jumièges is in the rural southern loop just downstream from Duclair. Yvetot is northwest from there, and Valmont is just east of Fécamp, on the coast. Étretat is the next down west along the coast shown on the map above. The next map shows Valmont, Fécamp, and Étretat in more detail. The last map above shows the Haute-Normandie coast in much more detail from Étretat through Fécamp, with Cape Fagnet just east of Fécamp. 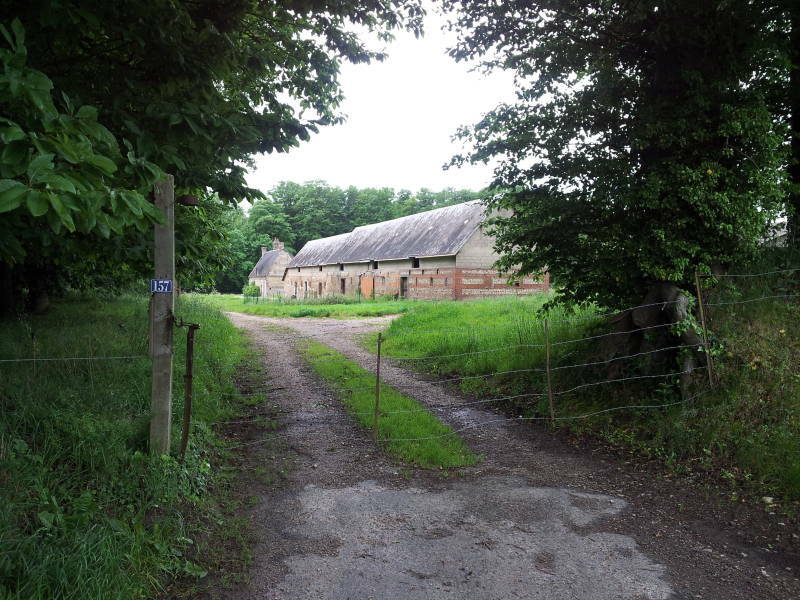 Yvetot was mentioned in records as Ivetoth and Ivetot in 1021, when Richard II, Duke of Normandy, gave some land to the monks of the abbey of Saint-Wandrille. The Old Norse -topt means "location" or "place", it appears in over 300 place names in Normandy. Yvetot was semi-independent. Its leaders were considered nobility as early at 1024. It was a small kingdom from the 1400s until 1551, and remained a principality (that is, ruled by a prince) until 1789. It became a trading center in the 17th century, as its independence made it a tax haven. Its cotton spinning industry expanded after the Revolution as the town became a major fabric manufacturer through the 19th century. The German army almost completely destroyed the town in 1940. The U.S. Army's 75th Division and 575th Signal Company established a command post here 14–20 December 1944 as they fought to push the Germany army back. 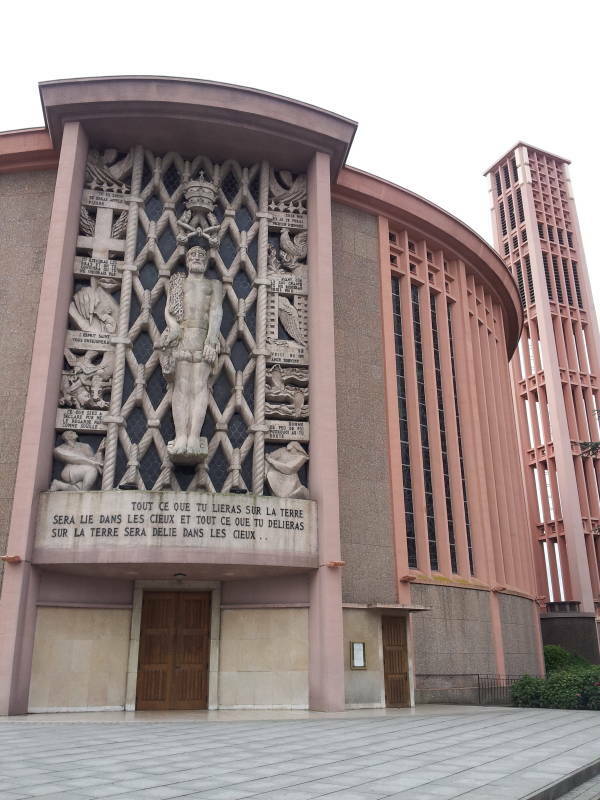 Yvetot's Round Church of Saint Peter was built in the 1950s as the town was rebuilt after World War II. It is 40 meters in diameter and 20 meters high. Its stained glass window, with an area of 1,046 square meters, is one of Europe's largest stained-glass windows. 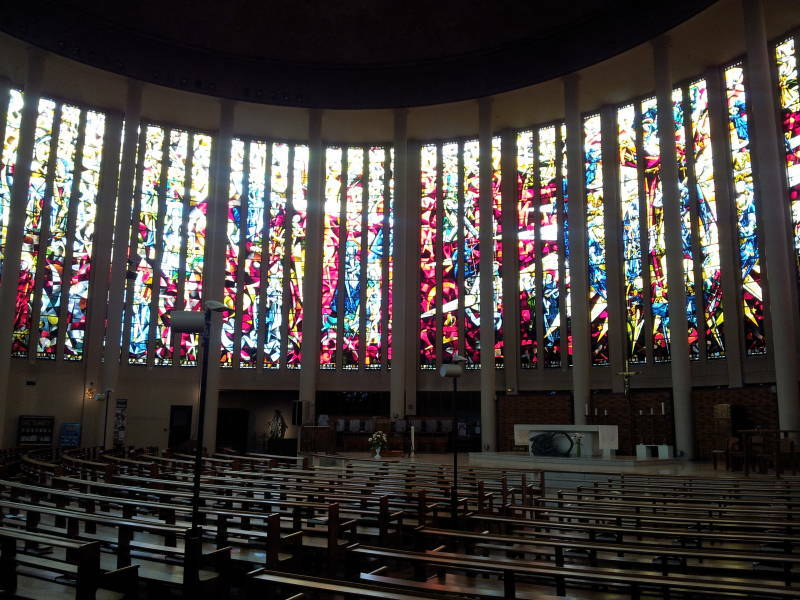 The stained-glass artist Max Ingrand created the window. Christ is at the center, with Peter (patron saint of Yvetot since its origins) on one side and other apostles on the other. A large section commemorates the Normans. 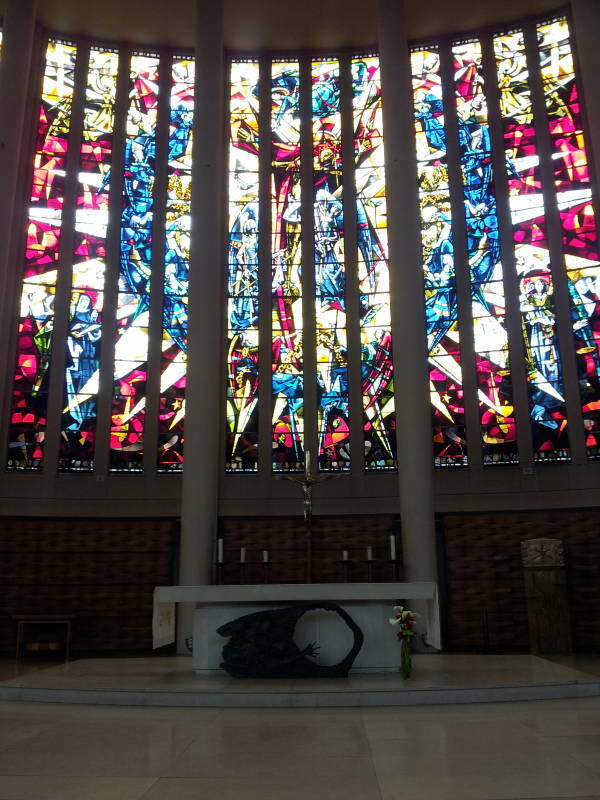 The huge window also includes figures from local church history and Joan of Arc. Gilles Beuzelin built this château in 1632. He was a member of the parliament of Rouen. 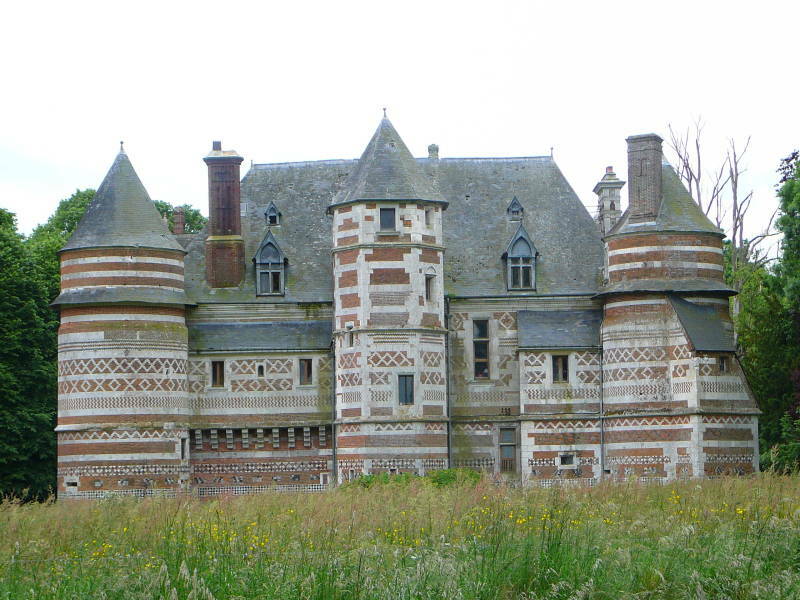 The château was later owned by the Duke of Normandy. The Germans seized the property in February 1944. 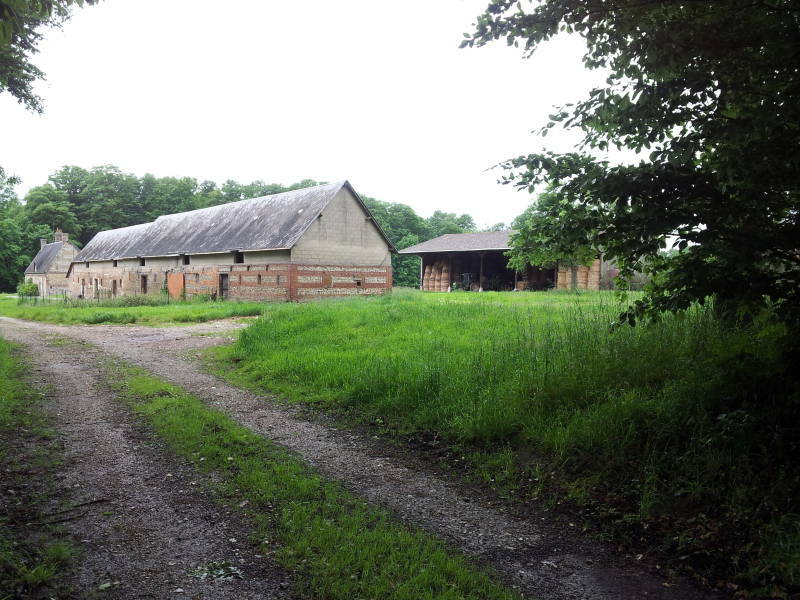 They gutted the interior while they were turning the property into a launch base for the V-1 flying bomb. After the war the château was restored. The V-1 or Vergeltungswaffe 1 (or "Retaliation Weapon #1") was a cruise missile powered by a pulsejet firing 50 times per second and producing a distinctive noise. It had a range of 250 kilometers and carried a warhead with 850 kg of Amatol-39. Amatol is a mixture of TNT (or 2,4,6-trinitrotoluene) and ammonium nitrate. So, C6H2(NO2)3CH3) plus NH4NO3. The British named it amatol, a mash-up of ammonium and toluene. Pure TNT is deficient in oxygen. The ammonium nitrate provides oxygen and increases the explosive strength of a given measure of TNT as long as TNT remains above 60% of the mixture. A form of it, ammonite, with a 20:80 mix of TNT and ammonium nitrate, is still used for quarrying and mining. The V-1 had small wings and an engine with low static thrust. This meant that it could not take off under its own power without an impractically long runway. A Dampferzeuger or "steam generator" system powered by hydrogen peroxide (or H2O2) and potassium permanganate (or KMnO4) propelled the V-1 up an inclined launch ramp. It was a powerful launch catapult. The V-1 was moving at about 580 km/h by the time it reached the end of the launch ramp, which was built of six to eight six-meter sections. 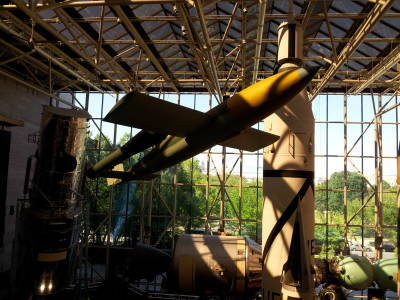 V-1 on display at the National Air and Space Museum in Washington, USA. We'll assume constant acceleration, so an average velocity of 80.5 m/s. For the longer ramp, the V-1 reached the end in just 0.6 seconds. The acceleration was 267 m/sec2, meaning that the catapult accelerated the 2,150 kg V-1 at 27.2 G.
Oof. That's a lot of acceleration. The V-1 engine increased its speed to 640 km/h as it climbed to its operational altitude of 600 to 900 meters. The first V-1 was launched toward London one week after the D-Day landings, on 13 June 1944. Over 100 V-1s were launched per day at the peak. The launch rate decreased as the launch sites were overrun by the Allied advance. 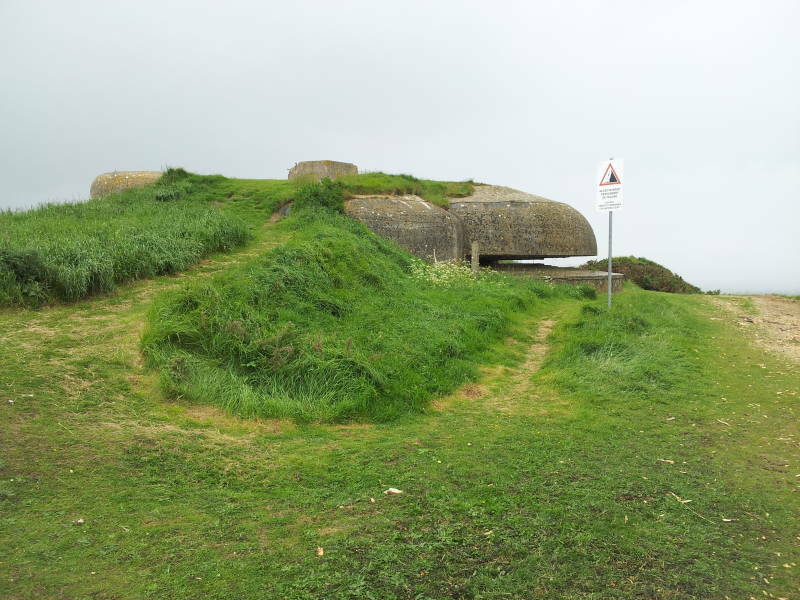 The last V-1 site within range of Britain was captured in October 1944. By then 9,521 V-1s had been fired at south-eastern England. 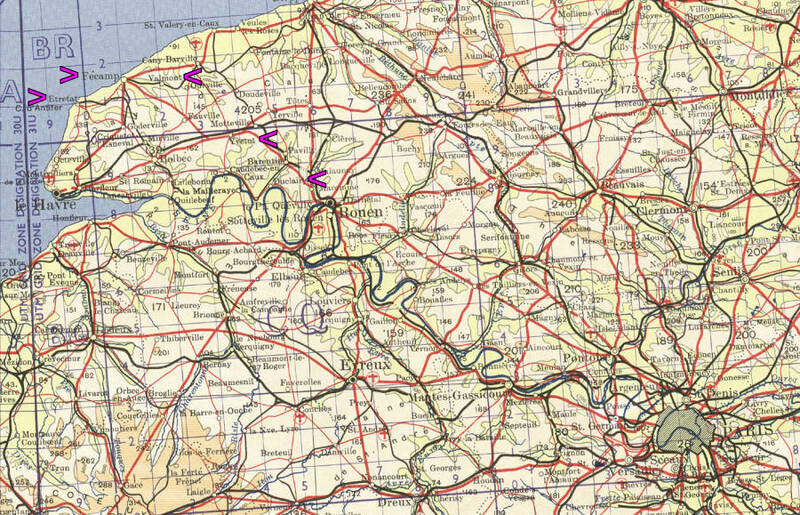 Another 2,448 were fired at Antwerp and other targets in Belgium, with V-1 attacks continuing until 29 March 1945, less than six weeks before Germany's surrender on 8 May. 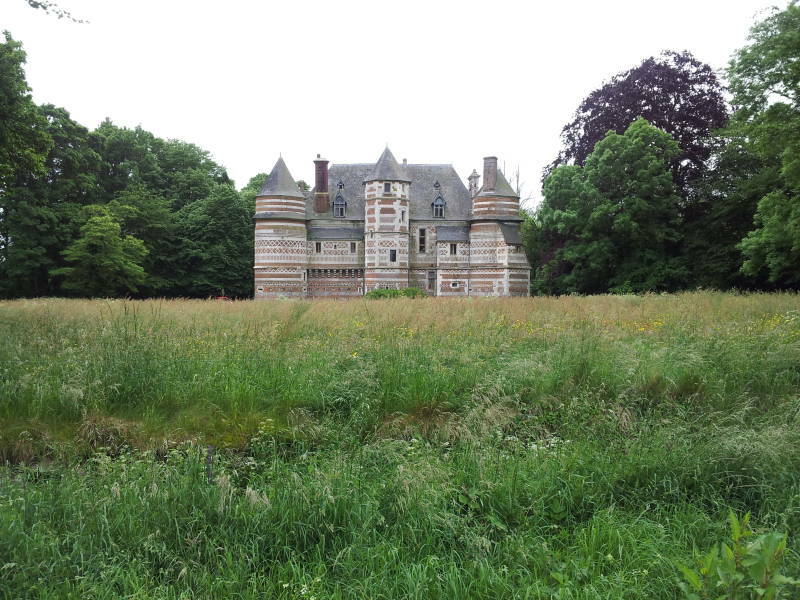 The château interior has been restored, and the property is operating as a farm. Abbaye de Valmont was founded in 1169. It was always small, never housing more than 25 monks, and it was destroyed and rebuilt several times. The abbey church was only completed in the 1500s. It went under some reforms, or at least attempted reforms, through the 1600s and 1700s. It finally went through a successful reform just in time to be dissolved in the Revolution in 1789. It stood in ruins for almost two centuries. The painter Eugène Delacroix often stayed at his family's estate at Valmont in the 1800s. His drawing Ruines de l'abbaye de Valmont is now in the collection of the Louvre. The abbey was re-established as a monastic community in 1994. 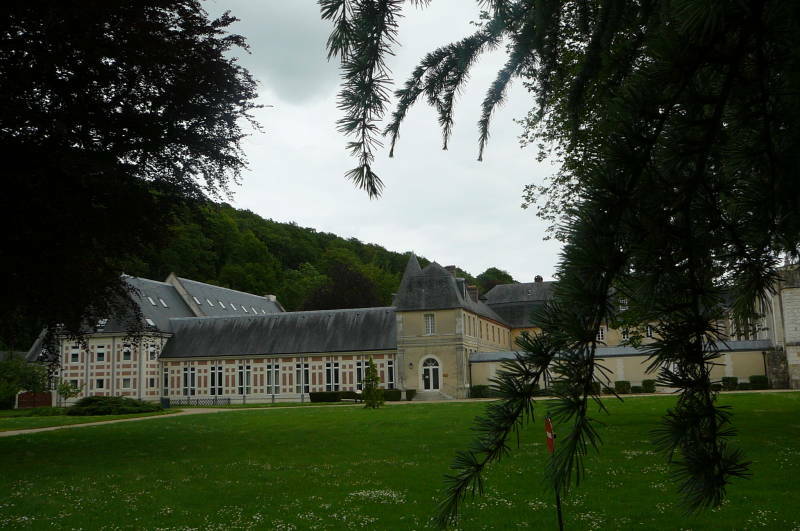 It hosts the Benedictines de Nôtre-Dame-du-Pré from Liseux. The abbey church was rebuilt from the ruins of the church built in 1520 and rededicated in 2004. The only surviving part is the axial chapel of the abbey church, dating from the 16th century and surviving the collapse of the main nave in 1730. 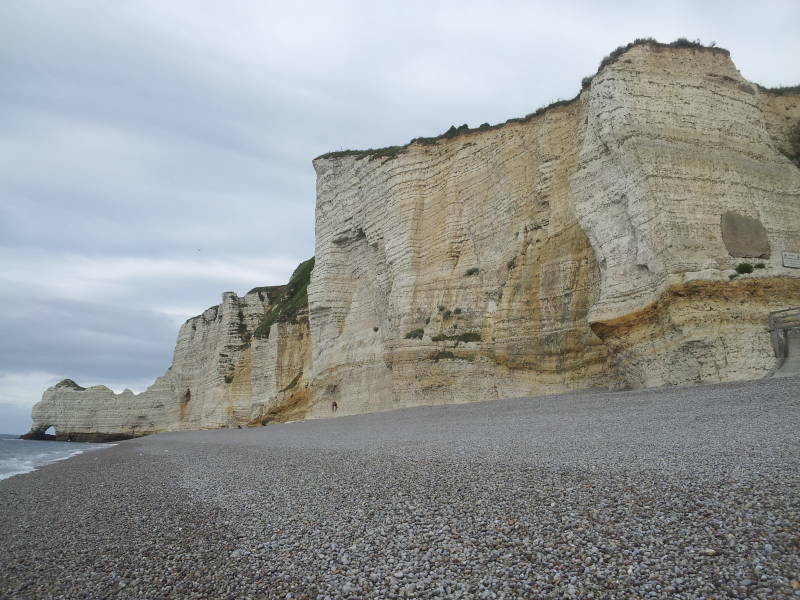 The Côte d'Albâtre or the Alabaster Coast is a 120-kilometer stretch of chalk cliffs. 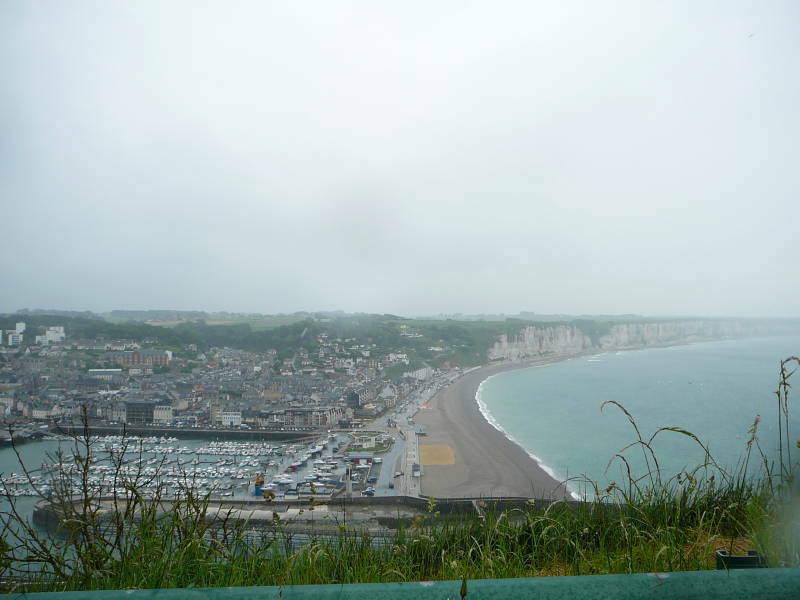 It extends from near Le Havre at the mouth of the Seine river northwest to the fishing village of Le Tréport, including Étretat, Fécamp, and Dieppe. The cliffs rise from 60 to 120 meters in height. The material is chalk, a soft white form of limestone, with periodic layers of dark flint. Chalk is calcium carbonate, CaCO3. It forms on sea floors as micro-organisms shed their tiny calcite shells. The chalk deposits in this area of western Europe are unusually thick, as calcium carbonate accumulated during very stable conditions lasting tens of millions of years. The Côte d'Albâtre and the White Cliffs of Dover across the channel in Britain are part of the same formation. There are prominent chalk deposits across much of northern France, including Champagne, the Seine river valley and the lower Loire Valley. There have been entire towns carved into the soft chalk, such as Haute-Isle, and people often excavate wine cellars and other storage facilities. The dark layers are flint, a form of quartz, SiO4 plus some impurities that make it nearly black instead of clear. The soft chalk is dissolved by waves and, less rapidly, by rain, causing the cliffs to erode away from the sea. The freed hard flint falls to the waterline, where wave action knocks the flint pieces against each other to yield the small round stones making up the beaches. Three large "hanging valleys" pierce the cliffs where rivers empty into the sea. Fécamp is in one of these, at the mouth of the Valmount river. Cape Fagnet is the north edge of this valley, with cliffs 105 meters high, about as tall as any along the coast. 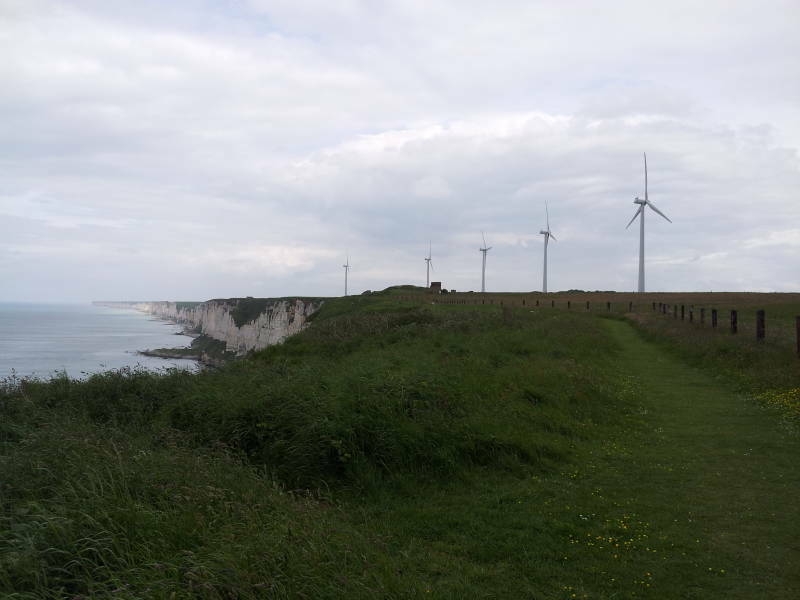 A wind farm generates electricity from the almost constant wind off the channel. France generated 570 TWh of electrical power in 2009. Only 10.4% of that came from fossil fuels. 80.1% of the 570 TWh came from nuclear energy, the world's highest percentage of nuclear-powered electricity. France produced 14.9 TWh of electrical power from wind in 2012, so about 2.6% of the national total. In the U.S. in 2010, 69.5% of electrical power came from fossil fuels. But in 2012 140.9 TWh came from wind, and in 2014 4.44% of all generated power in the U.S. came from wind. This coast and southeastern Britain are part of the same chalk formation. During most of the Pleistocene era there was a flat area of dry land joining Britain to the continent. Between 450,000 and 180,000 years ago there were two catastrophic floods when a large glacial lake in the Doggerland region, now beneath the North Sea, broke out and released up one million cubic meters of water per second. These floods poured down to the southwest through this area, cutting away the soft chalk. The catastrophic floods cut through the chalk all the way down to bedrock, and Britain was now an island. 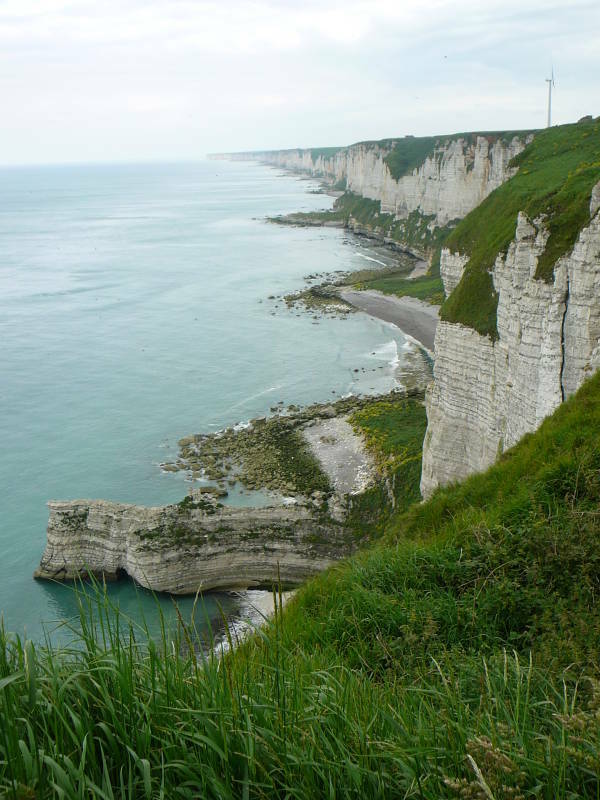 Cliff erosion over the millennia has widened the channel between Britain and the continent. Sea level sank so far during the last glacial maximum that today's North Sea was dry land, allowing settlement of Britain before the seas rose again. Much later, in the Neolithic times of about 4,000 to 2,500 BCE, there was a settlement on the high ground inland from the river's mouth. The settlement was surrounded by about 2000 meters of walls and ditches, and was occupied until Roman times. The Gauls had a road through here before the Romans arrived. The Romans had a road between today's Fécamp and Étretat, which was used through the centuries and became the route for the D940 road. 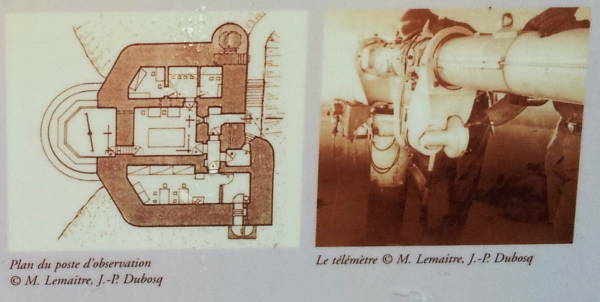 Fécamp had an abbey, shipbuilding, and fishing. Leodegarius, known later as Saint Leger, was deported in the 7th century to Fécamp where the abbey accepted him. The Norsemen came raiding in the 9th century. They settled in this area and gave Norse names to many locations. Norman Dukes Richard I and Richard II were both born here in Fécamp, in 933 and 963 respectively. During the Hundred Years' War the English invaded, burned, and occupied Fécamp in 1410. Henry V landed at Harfleur in August 1415. He took Fécamp on 9 October on his way to the Battle of Agincourt on 25 October 1415. Fécamp, visible from Cape Fagnet in the picture below, has been a fishing town for ages. The abbey founded the port in the 11th century, supporting ship-building and fishing. Herring fishing declined in the 18th century as the harbor was silting up, the Dutch were competing, and it had become more attractive to smuggle goods to England. Alexandre-Prosper-Hubert Le Grand invented the Benedictine liqueur in Fécamp in the 19th century. Through the 19th and early 20th centuries the cod fishing industry became important. Three-masted ships would go out for more than six months at a time, salting the fish for storage aboard. It peaked in the early 1900s. In the 1970s over-fishing was collapsing the cod population. Canada banned access to the cod fishing areas in the northwest Atlantic. Now the port hosts a much higher percentage of pleasure craft. An observation tower now looks over the harbor and its approaches. It supports VHF/UHF marine antennas plus some small dishes for point-to-point microwave links. Cape Fagnet is an obvious place for an observation point, something not lost on the invading German forces during World War II. 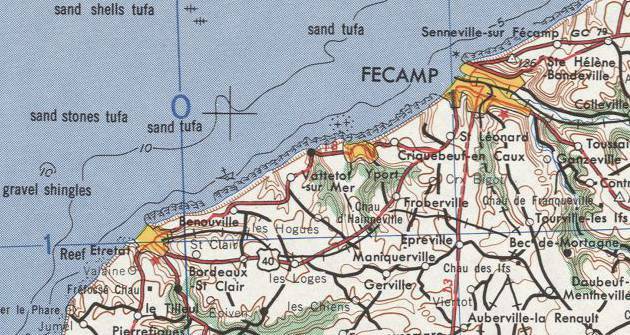 Fécamp was occupied by German troops from 9–10 June 1940 until 2 September 1944. In early 1942, Hitler feared an Allied invasion and ordered the Todt Organization, a civil/military engineering group, to plan and construct a system of fortifications. This system came to be called the Atlantikwall or the Atlantic Wall. 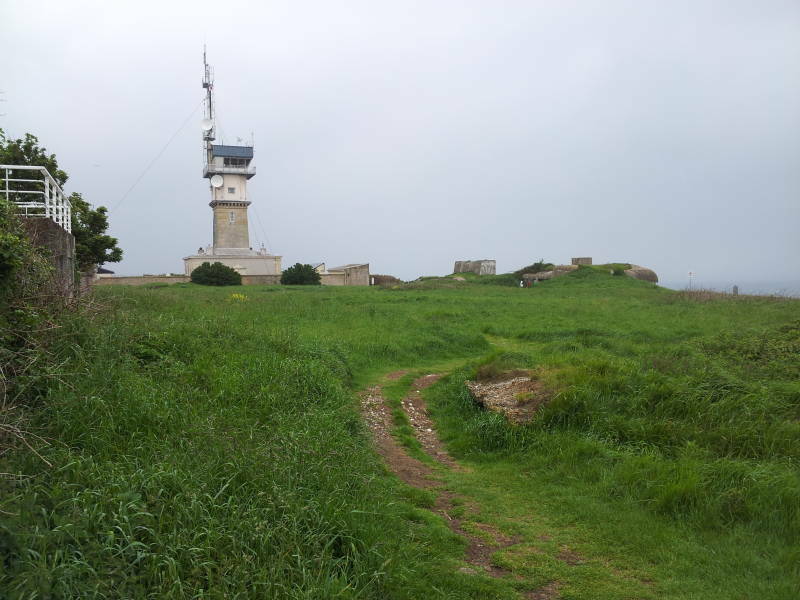 The Todt Organization built a lookout post here on Cape Fagnet overlooking the Fécamp harbor. 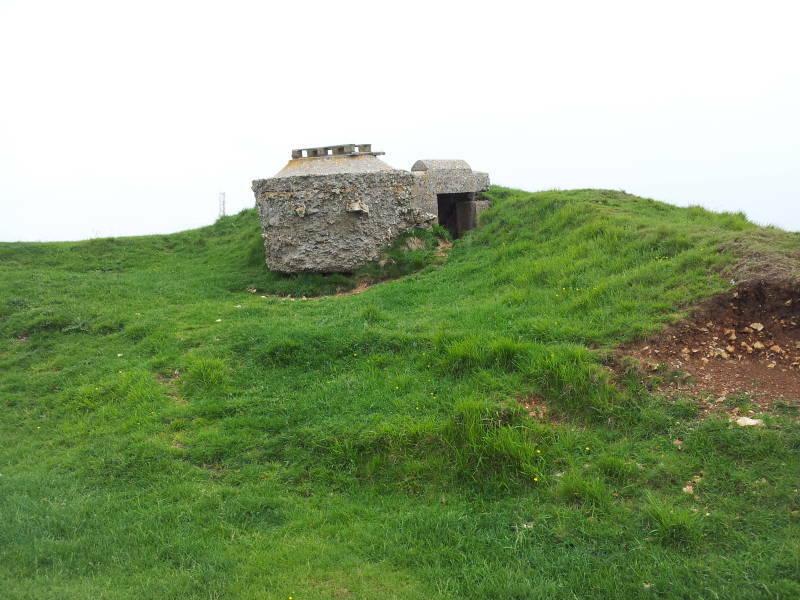 It included a lookout post and gunfire direction finder, a Mammut bunker, a lighter shelter, and several "Tobruk" gun emplacements. Field Marshall Erwin Rommel, called the "Desert Fox" for his exploits in North Africa, was assigned in early 1944 to defend Occupied France from the anticipated Allied invasion. 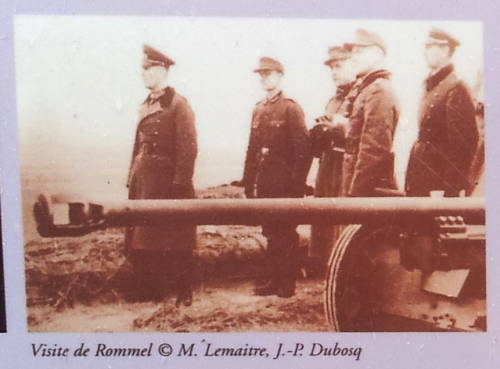 He established his headquarters at La Roche-Guyon on the Seine upstream of Rouen in February 1944. He soon made inspection tours of the German fortifications. The "Tobruk" was an Allied name for German defensive gun emplacements that they first encountered around Tobruk in North Africa. The German army officially called this a Ringstände. 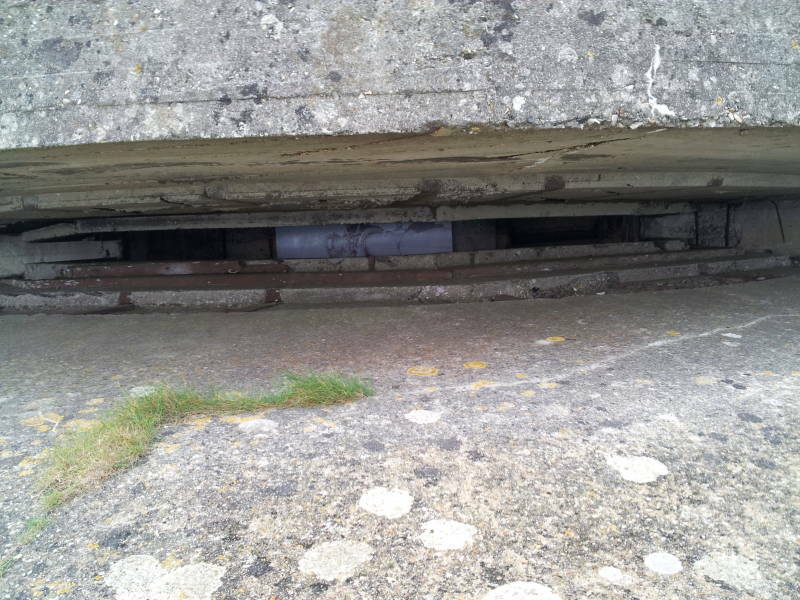 It was a small bunker made from concrete with a steel mounting ring for some sort of gun. They frequently mounted a turret from an obsolete tank on the mounting ring. 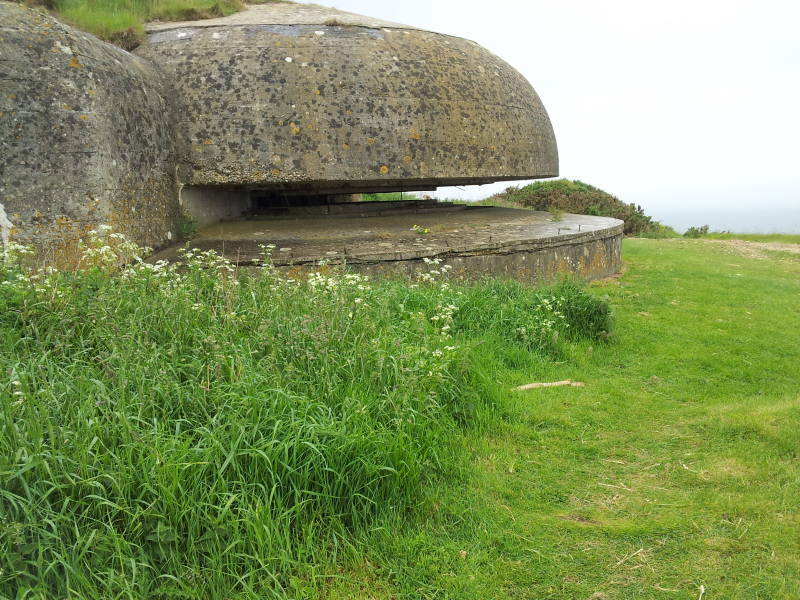 Here is one of the surviving "Tobruk" emplacements. Allied bombing and erosion has exposed it. The only parts that would have been exposed are the shallow conical top at left and its small below-grade entryway at right. The largest mostly-intact component is this observation post with a narrow horizontal slit providing a 180° view of the sea. 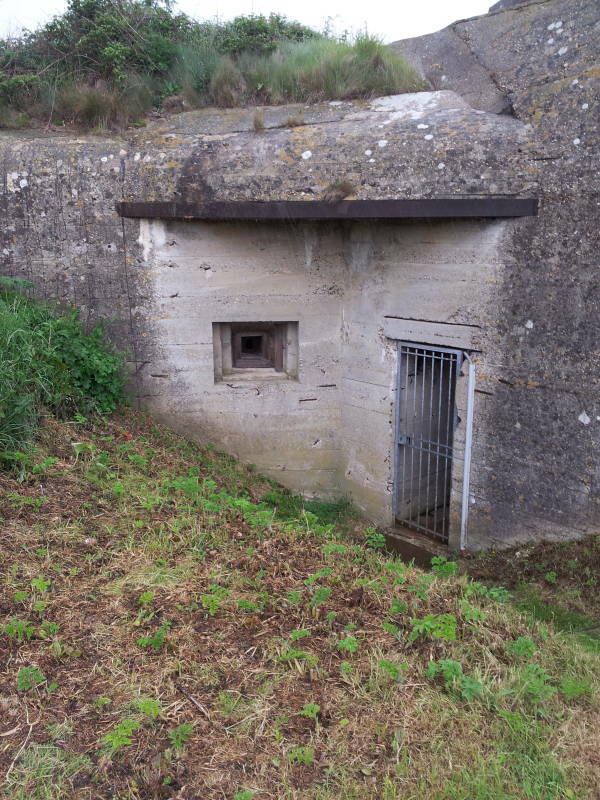 This outpost was linked to other stations along the French coast. 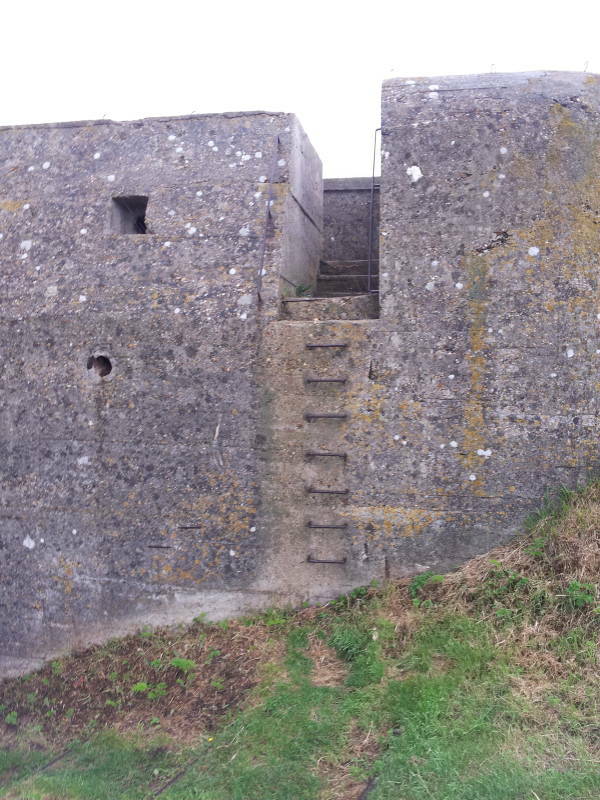 After the fortresses of Le Havre and Dieppe, Fécamp was the third best-defended port along the coast of Normandy. 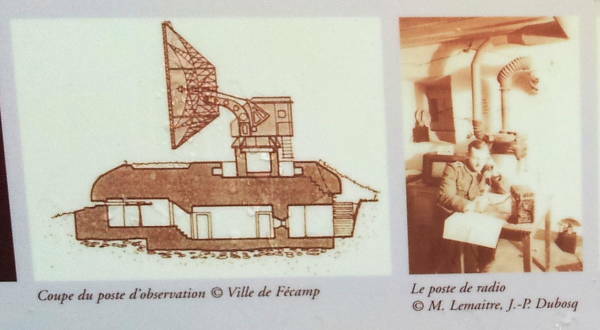 The blockhouse was equipped with the Würzburg radar system with a parabolic antenna 7.4 meters in diameter. It had a range of 40 to 80 kilometers. The Würzburg radar system was the primary ground-based gun-directing radar for German air defense. It used a klystron tube operating at 553–566 MHz, with a pulse length of 2 microseconds. This installation had the Würzburg-Riese or "Würzburg-Giant" model with the larger 7.4-meter dish. The feed was a very slightly offset rotating dipole. That yielded a range of up to 70 kilometers, with angular accuracy of 0.2° in azimuth and 0.1° in elevation. That's significantly tighter than the antenna's beamwidth, thanks to the conical scan resulting from the offset rotating feed. A Mammut mount and control bunker was constructed here, but the radar itself didn't get installed. The FuMG 41/42 Mammut was a long-range early-warning radar system, consisting of six or eight Freya antennas. The antenna array was fixed but it could be electrically steered through a 100° arc to the front and rear, making it the world's first practical phased array radar. It would detect targets at a range of 300 kilometers. It used a frequency range of 116–146 MHz, wavelengths with limited refraction over the horizon. This meant that aircraft had to be flying at altitudes up to 8,000 meters in order to be detected at the longer ranges. 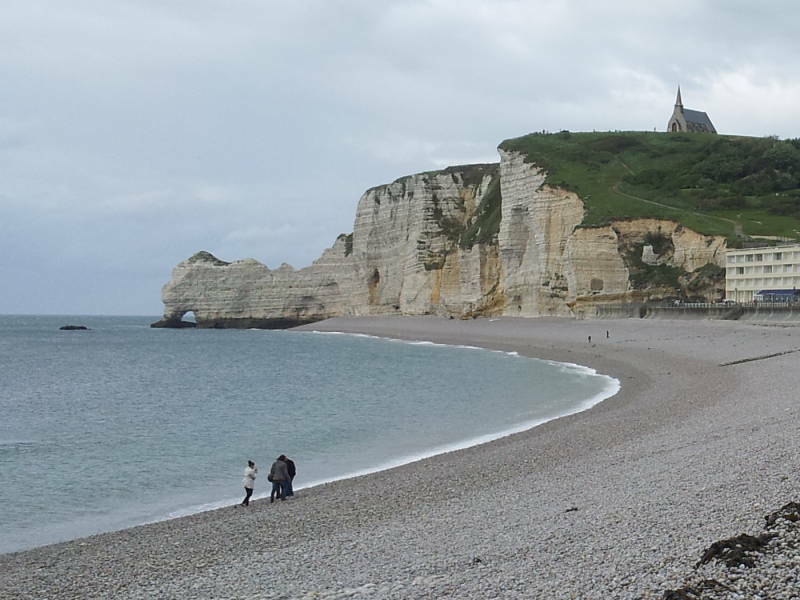 Étretat is also in a valley eroded into the cliffs, providing a stony beach front. 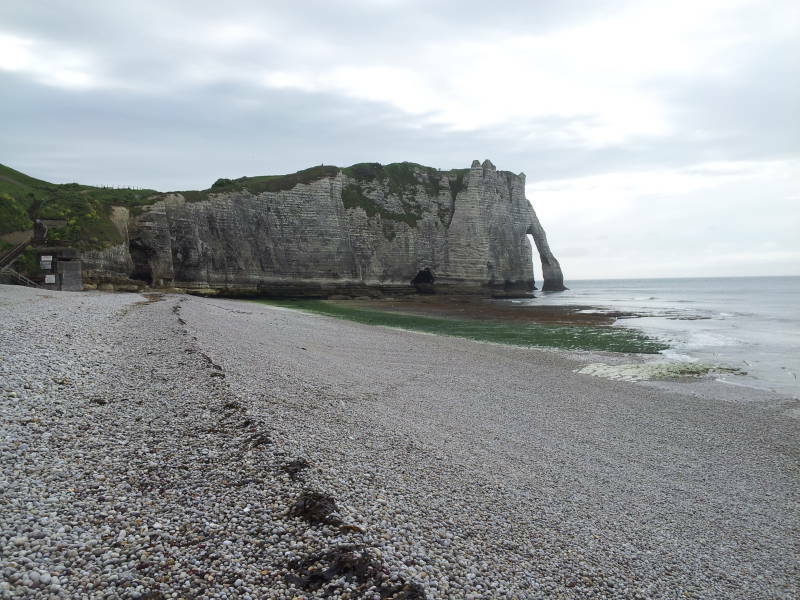 There are three famous natural arches, with the Porte d'Aval visible to the left from the beach and the Porte d'Amont visible to the right. The Manneporte, the largest of the three, is not visible from the town itself. 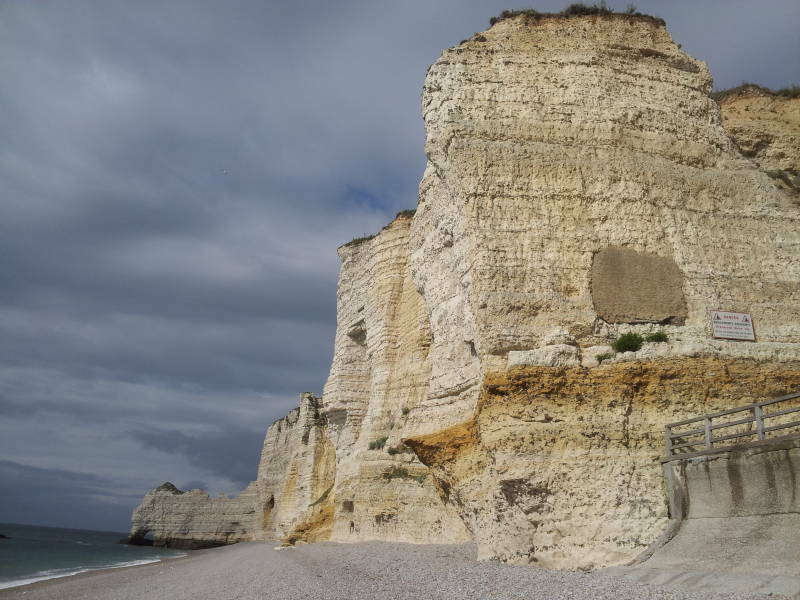 The arches formed due to harder regions within the chalk being more resistant to erosion. Étretat was once just a fishing village, but its economy has been based mostly on tourism since the middle of the 19th century. During the 18th and much of the 19th century kelp was harvested and burned on the beach to recover its iodine. Iodine-rich mineral deposits were discovered and developed in Chile in the late 1870s, largely ending the kelp-burning industry in Étretat. There are signs of human habitation here back into prehistory, but less information is available compared to the Fécamp settlement. Roman roads led to here, and a Roman aqueduct three kilometers long was destroyed in the first half of the 19th century. But it wasn't so much a Roman town as a Gaulish settlement gradually changing under Roman influence. There are traces of Merovingian times, which means the mid-5th to mid-8th centuries. And there are legends of Norsemen establishing the village. But just legends, not concrete evidence. Not every place has a detailed documented history. 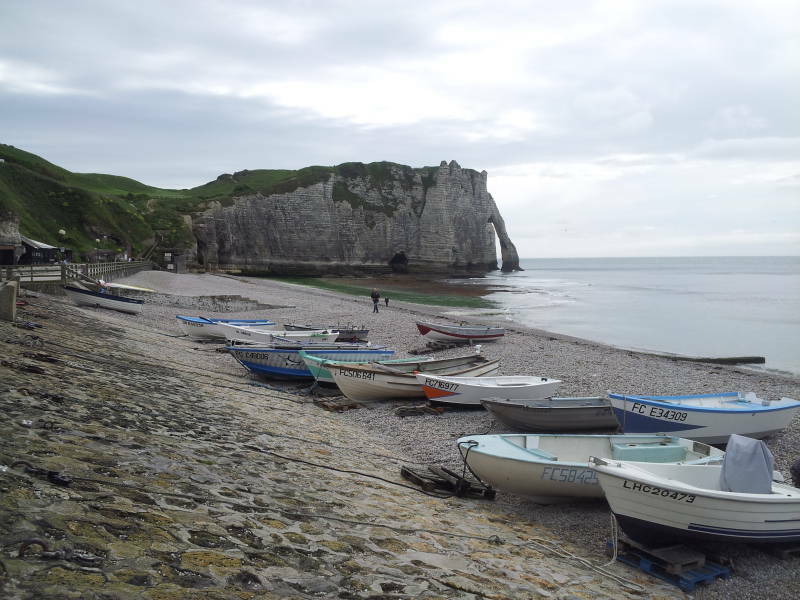 There were twenty-five to thirty fishing boats based at Étretat in the first half of the 19th century. By 1850 that number had sharply decreased. Alphonse Karr wrote Roman History of Étretat in 1836 (he also coined the phrase, among several others, "Plus ça change, plus c'est la même chose" or "The more things change, the more they stay the same.") 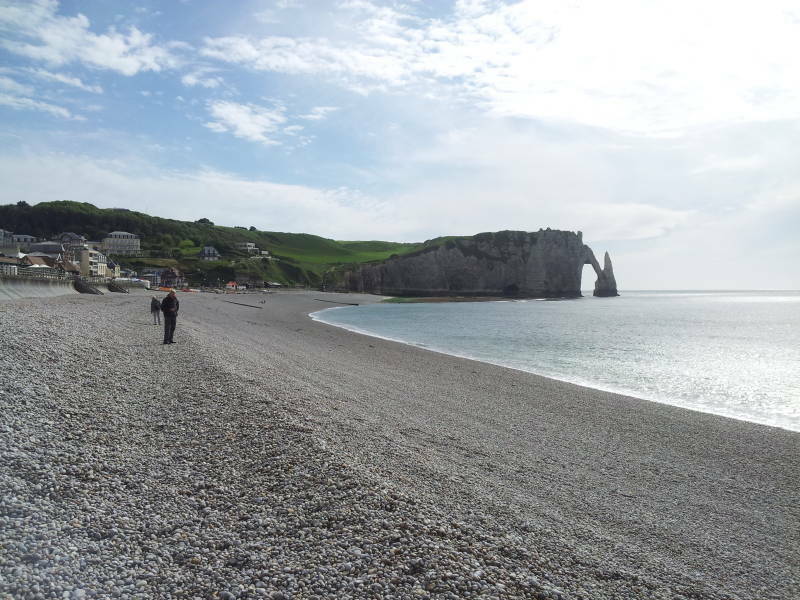 The popularity of his novel contributed greatly to the popularity of Étretat just as the town was becoming much easier to reach in the 1840s. Better roads were being built, and regularly scheduled coach service was established. Some people had the wealth and free time to take vacations, and the concept of seaside holidays was becoming more common. In 1852 things really took off with the construction of a casino with entertainment including opera performances. 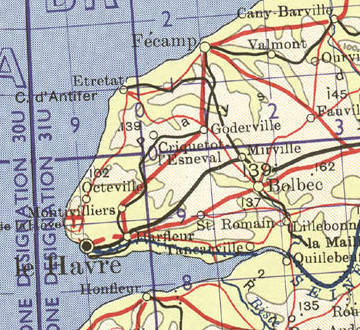 The railroad reached Étretat in 1890. 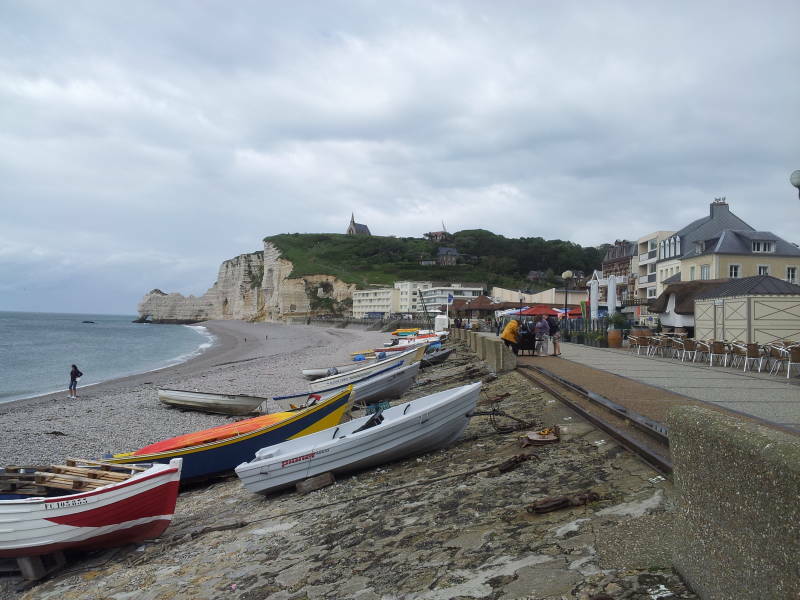 It has reached the point where Étretat is a victim of its own popularity in the high season, with so many visitors from Paris and Rouen flooding into the small town and overwhelming the streets and limited parking. The author Guy de Moupassant grew up at Étretat. His short story "L'Anglais d'Étretat" (or "The Englishman of Étretat") was based on his encounter with the English poet Algernon Charles Swinburne. Swinburne was drowning and Moupassant rescued him. Several of Moupassant's other stories and novels were set on this coast. 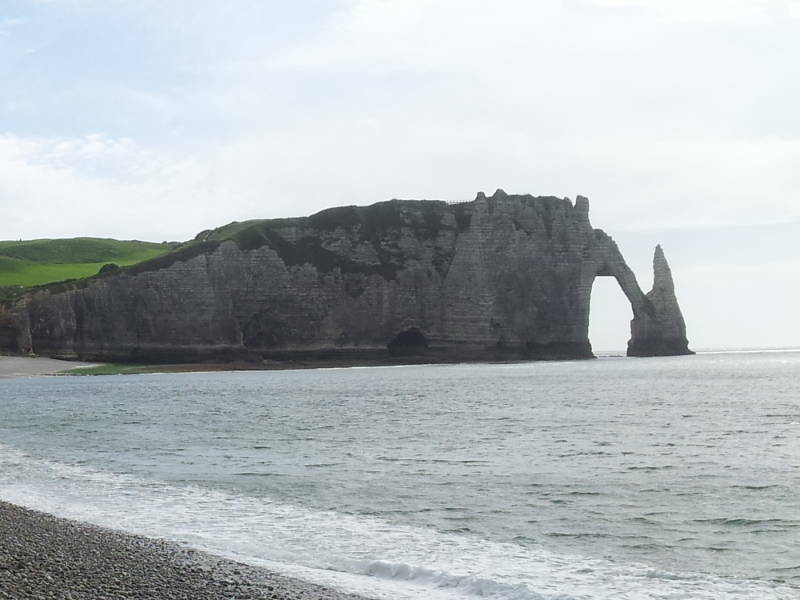 Maurice Leblanc's 1909 novel L'Aiguille Creuse or The Hollow Needle is partly set in Étretat and features the Needle freestanding rock next to the Manneporte arch. It's one in a series of novels featuring Arsène Lupin, the gentleman-thief. Belgian mystery author Georges Simenon set his 1950 novel Maigret et la Vieille Dame or Maigret and the Old Lady in Étretat. The Manneporte (Étretat) Claude Monet, 1883, Metropolitan Museum of Art, New York. Monet spent most of 1883 at Étretat, a fishing village and resort on the Normandy coast. He painted twenty views of the beach and the three extraordinary rock formations in the area: the Porte d'Aval, the Porte d'Amont, and the Manneporte. 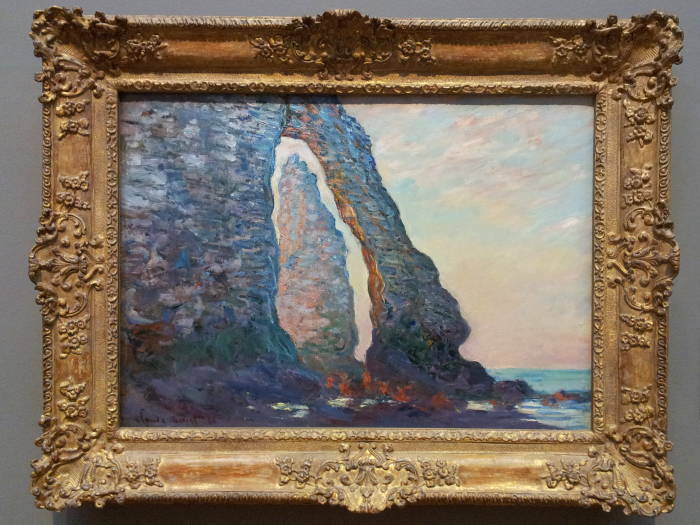 The sunlight that strikes the Manneporte has a dematerializing effect that permitted the artist to interpret the cliff almost exclusively in terms of color and luminosity. Most nineteenth century visitors were attracted to the rock as a natural wonder. Monet instead concentrated on his own changing perception of it at different times of the day. The Manneporte near Étretat, Claude Monet, 1886, Metropolitan Museum of Art, New York. In 1886, the writer Guy de Moupassant published his eyewitness account of Monet at Étretat. "The artist walked along the beach, followed by children carrying five or six canvases representing the same subject at different times of the day and with different effects. He took them up and put them aside by turns according to changes in the sky and shadows." Monet painted the dramatically arched projection in the cliff at Étretat six times from this angle: twice during each of three visits to the Normandy coast in 1883, 1885, and 1886. He refined the pictures in his studio. 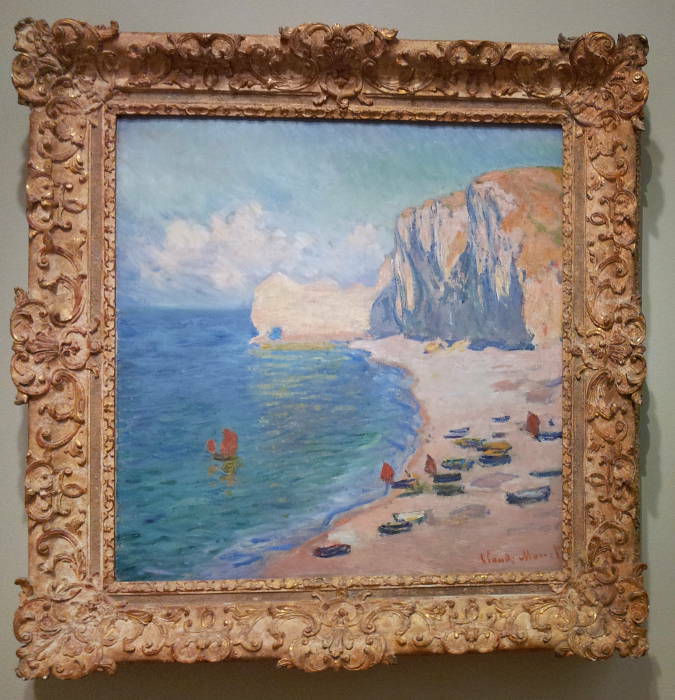 Étretat: The Beach and the Falaise d'Amont, Claude Monet, 1885, Art Institute of Chicago. 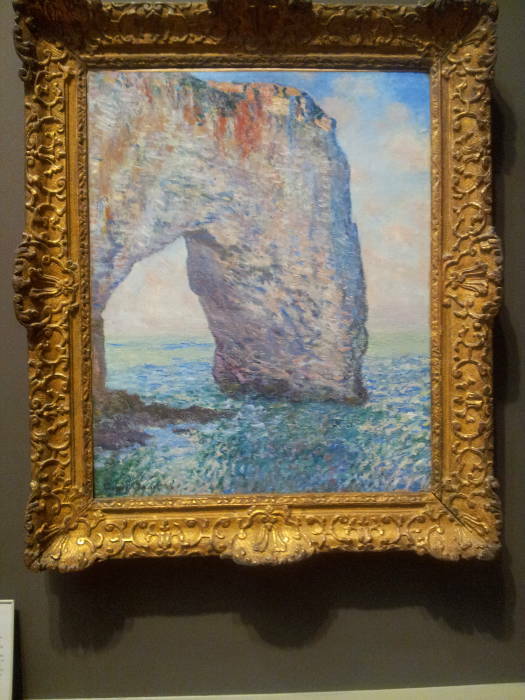 Étretat, l'Aiguille et la Porte d'Aval, Claude Monet, 1885-6, the Art Gallery of Ontario, Toronto. 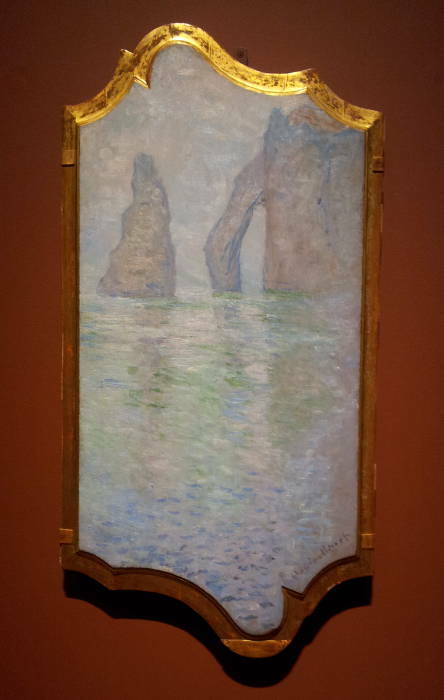 Claude Monet made two paintings on an Étretat hotel's armoire doors instead of paying his bill. The hotel had several dozen door panels painted by various artists hanging in the dining room. This one is now in the Art Gallery of Ontario, in Toronto. What looks like an extra-fancy frame is the edge of the panel that was removed from the door. 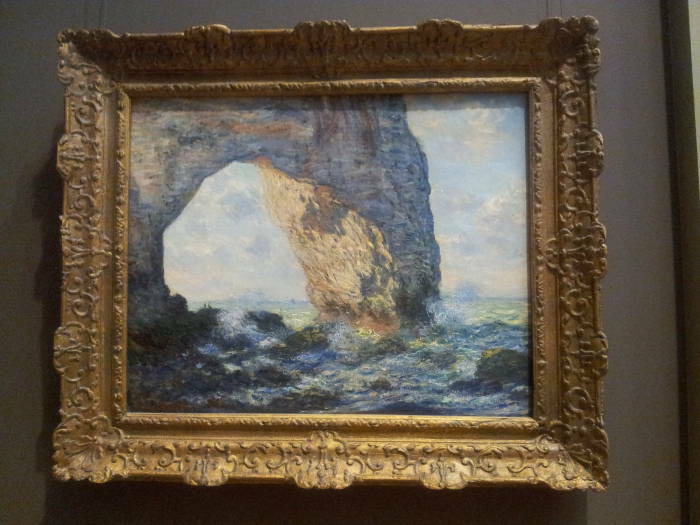 Rock Needle Seen through the Porte d'Aval, Étretat, Claude Monet, 1886, in the National Gallery in Ottawa. The nearby card says that he likely began painting it in the autumn of 1885, and then shipped it along with some fifty other canvases to his studio in Giverny, where he completed it and signed it in 1886. The lighting and tide correspond to late afternoon as the sun sets behind the cliff. Given the angle of view, Monet could only have been working from a stretch of shoreline that is exposed for a short time at low tide. He is far enough out that he can see the needle through the arch. Compare this to Monet's depictions above, where you only see sea and sky through the arch. 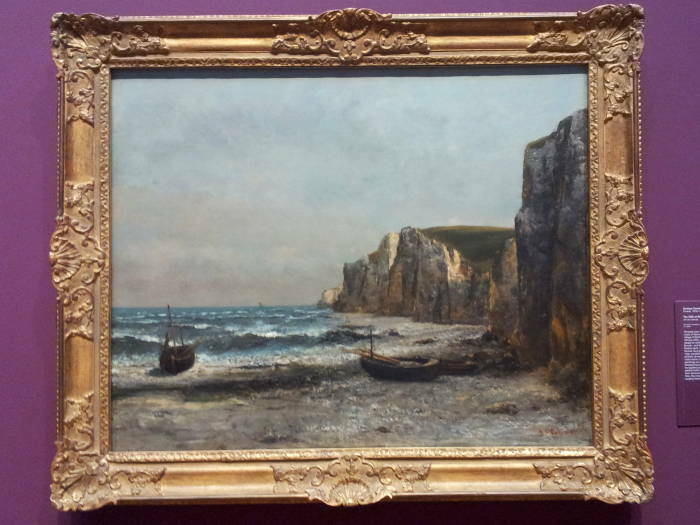 The Cliffs at Étretat, Gustave Courbet, 1866, in the National Gallery in Ottawa. Painted some 20 years before Monet's visits, the nearby card explains: "Here, in the Realist spirit, Courbet offers a factual record of the picturesque view, paralleling his candid depictions of everyday life." Courbet usually began his seascape paintings outdoors at the scene, and then finished them in his studio. Here he has applied paint with a flexible palette knife to highlight the random textures of the cliff face, the waves, and the surging foam along the shoreline. 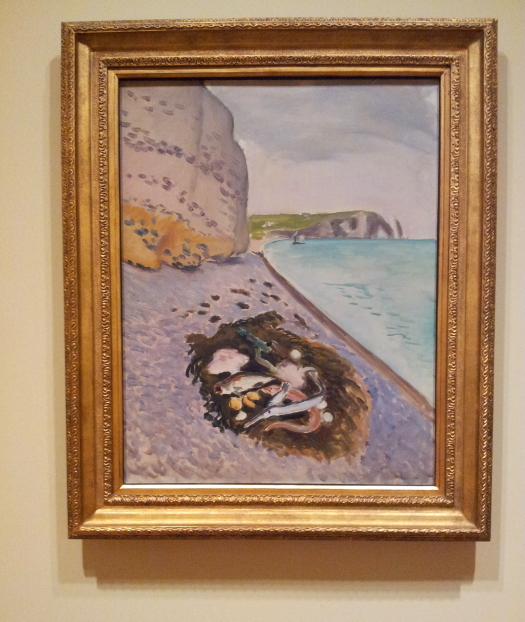 Henri Matisse visited Étretat in 1920. He made some paintings similar to those Monet created in the 1880s. The Pierced Rock, Henri Matisse, 1920, Baltimore Museum of Art. 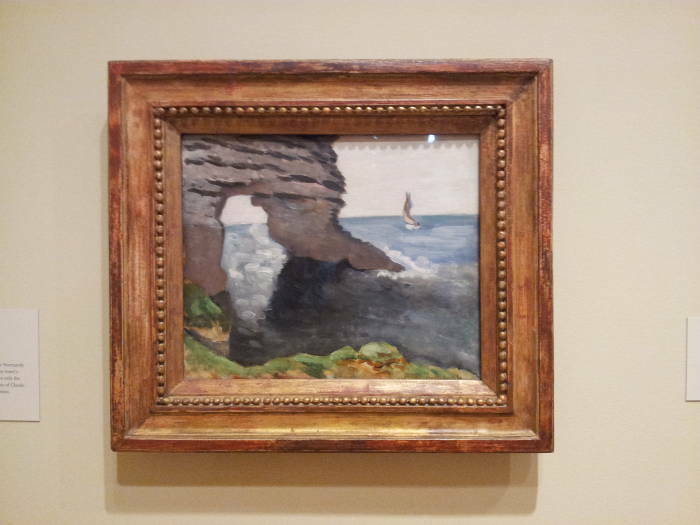 Large Cliff with Fish, Henri Matisse, 1920, Baltimore Museum of Art.